Because it is just a tool, it occurs to me that the "dharma" is always available to use in everything we do, not just when we are "meditating." Opportunities to practice whatever dharma technique we have learned are always all around us. Of course I understand that for each of us our personal "dharma" path is the exact process that leads to our own enlightenment, the particular method it takes to get our attention and full cooperation. There are said to be 84,000 dharmas or paths to enlightenment and I am told they are available in half-sizes too. One of those ought to fit me. Dharma as a business or even as an organization comes close to being an oxymoron. It is hard to organize religion, much less generally prescribe exactly what any one of us needs. That is why we have to do it for ourselves, i.e. find out by trial and error what dharmas actually work for us. I am afraid that too much is made of things that are said to be "dharmic" in life (good for us) as opposed to all those things that are not dharmic (said to be not so good for us). In other words, some things are pretty-much a waste of time as far as enlightening us is concerned, but nothing more than that. They are not evil by design. It should be obvious that dharma is more a process rather than some "thing," set of things, or states of mind, and that 'whatever' it is that we each have to do in our lives can be done in a dharmic fashion. I know, this may sound like a very Zen approach, along the lines of "Zen and the Art of Motorcycle Maintenance," which itself is a play on "Zen in the Art of Archery," and so on, yet the idea is simplicity itself. So true, and I believe in investing in beauty, and "beauty" of any kind is dharmic, part of the dharma process. What I am pointing at here is that what we call "dharma" is a process or method of acting and not just some state of "holiness" set apart from every-"thing" else. There is no such "thing." Dharma is a process or action, and that process is a path that leads to enlightenment rather than to its opposite, aggression. "You cannot salt the salt" is the old saying, and you cannot improve the dharma. We can't "dharma" the dharma. Like the laws of nature, the dharma is already pristine, inviolable, or as my first dharma teacher used to say: "My God is no beggar. He does not need me to make the ends meet. The ends already meet!" The old Zen koan "If you meet the Buddha on the road, kill him," does not mean to murder anyone, but simply that adding a fancy hat or title to the dharma does not improve it. If we put distance between ourselves and the Buddha, even out of intended respect, we are neither honoring him nor our own potential. The Buddha, as in "Buddha Nature," is inside every one of us, not outside somewhere to find or meet on the road. That is what that saying is about. While, dharmically, there may be some hierarchy as to what is worthy in life to associate with, there is no dharmic hierarchy in how we respond to each event life presents us. The great Mahasidda Tilopa worked in a brothel. Don't tell me he was stained by it. The beauty in our life that comes from music, art, poetry, literature, and so on, is just another way into the nature of our own mind. There is nothing "non-dharmic" about things of beauty. They exist to flag us down and direct us inside. They catch our eye and help us to turn away from all our normal distractions. That is what I call an "inscape," something beautiful that distracts us from our distractions, so to speak, however temporarily. I can't see myself becoming a monk, putting on robes, or assuming a title, even if I ever manage to realize something. The dharma cries out to be used and put to work, for it is nothing more (yet no less) than a method and path – a way in. I like sharing what little I know about the dharma with others, but aside from trying to enlighten myself, what am I doing with it? The answer had better be "nothing," because as mentioned earlier, we don't use dharma on dharma, so to speak. We can't. The dharma does not have a shelf life, but is always used real-time and in the present. As mentioned, you can't salt the salt. We use the dharma in everything we do, but not on itself. Excessive dharma is not dharma, but just more excess. That is what "skillful means" is all about, appropriate action and response. That is dharma. And it is the nature of the dharma to throw us back on ourselves, always forcing us to figure out who or what we are and why. There is no free lunch. The dharma keeps reminding me that I am going to have to do this all by myself and, as Trungpa Rinpoche pointed out, there is no one who is going to save us. That thought is sobering. One of my favorite dharma images is that of the dharmachakra (the dharma wheel) illustrated here. 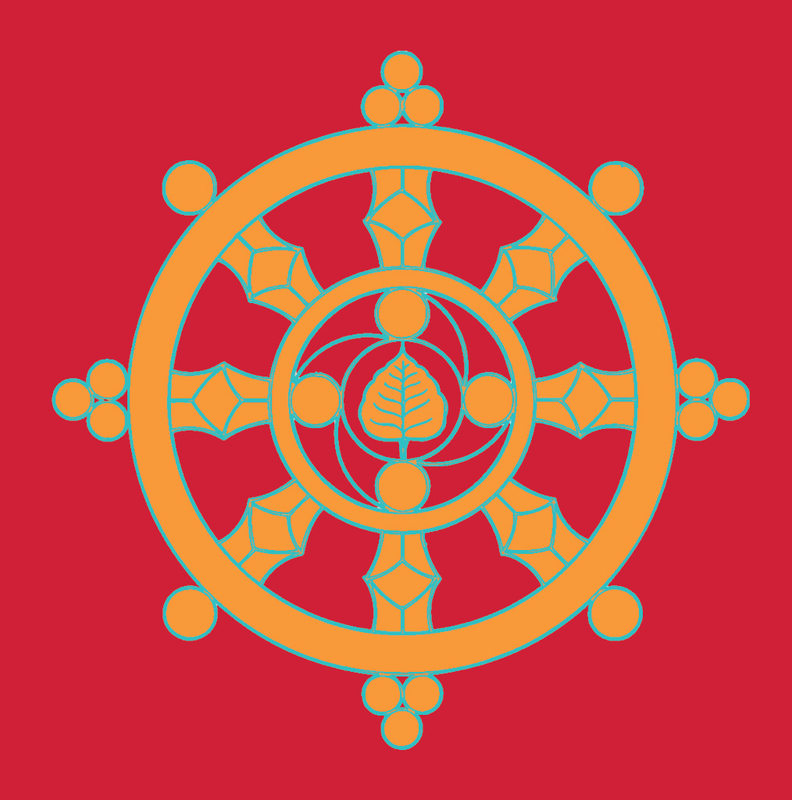 It is said that the Buddha (and great teachers) turn the wheel of the dharma. I believe this is true for any of us. We too have to turn the wheel of our own dharma if we want anything to progress. No one will turn it for us. It will just sit right there until we turn it. And the dharma is definitely a pay-as-you-go system. Sometimes I imagine a dharmachakra, but with a big crank on it to remind us to turn it. My point here is that the dharma is nothing more than a method, and never a thing in itself. Something is sacred, like certain dharma texts, only because they contain instructions for pointing out the dharma. The same is true of people and dharma teachers. It is what they hold that is precious, not that any vehicle should be disrespected. Anything beyond that and we are attempting to gild the dharma (which can't be done), creating icons of our own design that beg to be respected or worshiped for their own sake, not for what they contain or point to, and this is not helpful, certainly not dharma.